Like humans, canine companions often find themselves in noisy environments, and are expected to respond to human speech despite potential distractors. Such environments pose particular problems for young children, who have limited linguistic knowledge. Here, we examined whether dogs show similar difficulties. We found that dogs prefer their name to a stress-matched foil in quiet conditions, despite hearing it spoken by a novel talker. They continued to prefer their name in the presence of multitalker human speech babble at signal-to-noise levels as low as 0 dB, when their name was the same intensity as the foil. This surpasses the performance of 1-year-old infants, who fail to prefer their name to a foil at 0 dB (Newman in Dev Psychol 41(2):352–362, 2005). Overall, we find better performance at name recognition in dogs that were trained to do tasks for humans, like service dogs, search-and-rescue dogs, and explosives detection dogs. These dogs were of several different breeds, and their tasks were widely different from one another. This suggests that their superior performance may be due to generally more training and better attention. 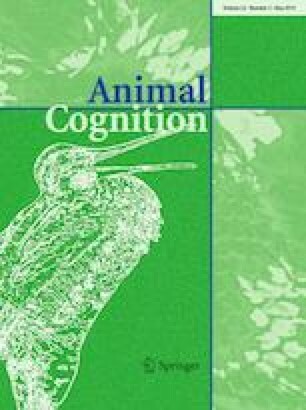 In summary, these results demonstrate that dogs can recognize their name even in relatively difficult levels of multitalker babble, and that dogs who work with humans are especially adept at name recognition in comparison with companion dogs. Future studies will explore the effect of different types of background noise on word recognition in dogs. Amritha Mallikarjun, Emily Shroads, and Rochelle S. Newman all declare that they have no conflict of interest. All applicable international, national, and institutional guidelines for the care and use of animals were followed. This study was approved by the University of Maryland Institutional Animal Care and Use Committee (approval code: 1034861-6). Informed consent was obtained from the owners of the dogs in the study. Informed consent was not required from either the speakers that provided readings for our nine-talker background noise, nor the speaker who produced the dogs’ names.